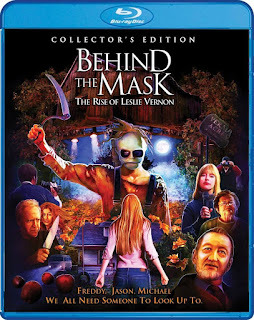 Scream Factory has announced that they will be bringing Behind the Mask: The Rise of Leslie Vernon to blu-ray on March 27th. Behind the Mask is being released as a "Collector's Edition" which means that there will be a slip sleeve (guranteed for the first three months of the blu-ray's release) that features commission artwork. You can preorder the blu-ray from Shout Factory's website here. You will get the blu-ray two weeks early and a poster featuring the new artwork.